To understand why, we need to trace the path of electrons from the wall socket back to power generators and the markets and policies that dictate that flow. 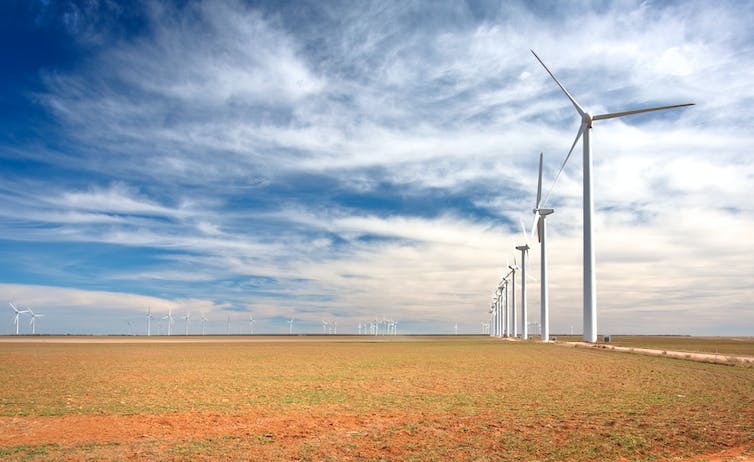 As energy scholars based in Texas—the national leader in wind—we’ve seen these dynamics play out over the past decade, including when Perry was governor. Part of Perry’s review is aimed at establishing how wind and solar, which are variable sources of power, are affecting so-called baseload sources—the power plants that provide the steady flow of electricity needed to meet the minimum demand. In competitive markets like ERCOT, companies that run power plants place bids into an auction to provide electricity at a certain time for a certain price. A bid stack is jargon for “a stack of bids”—or the collection of all these bids lined up in order by price – in auction-based markets (such as Texas). How do renewables affect the bid stack? Renewable sources such as wind, solar and hydro have no fuel costs—sunlight, wind and flowing water are free. That means their marginal operational cost is near zero; the cost is essentially the same to operate one megawatt of wind as compared to the cost of operating 10 megawatts of wind since generators don’t need to buy fuel. That means as more wind and solar farms are installed, more capacity is inserted at the cheapest end of the bid stack. This insertion pushes out other generators such as nuclear, natural gas and coal, causing some of them to no longer be dispatched into the grid—that is, they don’t supply power into the grid (or get paid). So as more renewables are installed, power markets dispatch fewer conventional options. And, because the marginal cost of these new sources is almost free, they substantially lower the cost for electricity. This is great news for consumers (all of us) as our bills decrease, but bad news for competitors (such as coal plant owners) who operate their plants less often and are paid less when the plants do operate. What does all this mean? Natural gas and renewables are affecting coal in two ways. Natural gas is a direct competitor with coal because both can be dispatched—turned on—when a grid operator needs more power. That is helpful for grid reliability. But, as the cost of natural gas has fallen, coal has become less competitive because it is cheaper to operate a natural gas power plant. Research at the University of Texas at Austin shows that while installing significant amounts of solar power would increase annual grid management costs by $10 million in ERCOT, it would reduce annual wholesale electricity costs by $900 million. The result of all this is that renewables compete with conventional sources of power, but they do not displace nearly as much coal as cheap natural gas. In fact, cheap gas displaces, on average, more than twice as much coal than renewables have in ERCOT. 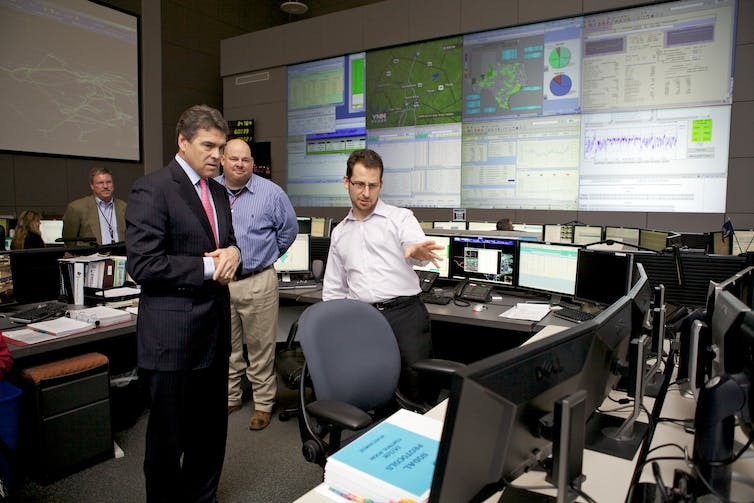 The wholesale markets for electricity in Texas were modernized under then-Governor Rick Perry while forecasting for wind output improved. Figure showing increasing wind in ERCOT and decreasing regulation requirements. The drop in requirements is due to market operational changes. 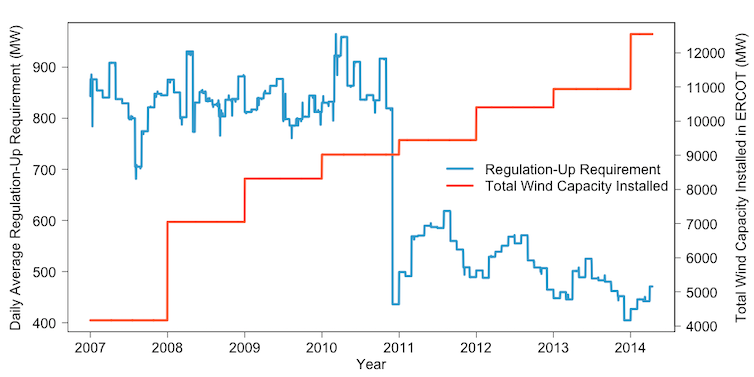 There does not appear to be any correlation with increasing wind and regulation procurements. But there is still more to do—information technology coupled with integrated hardware can help. Consider this: There are 7.7 million smart meters in Texas, most of them residential. We’ve estimated that installing 7 million controllable thermostats for just the households in Texas would cost $2 billion. Residential air conditioning is responsible for about 50 percent of peak demand in Texas in the summer. That means about 30 gigawatts of peak demand in Texas is just from residential air conditioners. By dynamically managing our air conditioning loads—that is, adjusting thermostats to lower overall demand without impacting people’s comfort—we could reduce peak demand by 10 to 15 GW. That means we might not need $10 billion to $15 billion worth of power plants. Spending $2 billion to avoid $15 billion is a good deal for consumers. In fact, you could give the thermostat away for free and pay each household $700 for their trouble and it would still be cheaper than any power plant we can build. Joshua D. Rhodes, Postdoctoral Researcher of Energy, University of Texas at Austin; Michael E. Webber, Professor of Mechanical Engineering and Deputy Director of the Energy Institute, University of Texas at Austin; Thomas Deetjen, Graduate Research Assistant, University of Texas at Austin; and Todd Davidson, Research Associate, Energy Institute, University of Texas at Austin. Editor's note: The views expressed by contributors to the Cynthia and George Mitchell Foundation's blogging initiative, "Can Texas's approach to sustainability inform a path forward for the U.S.?," are those of the author and do not necessarily represent the views of the foundation. The foundation works as an engine of change in both policy and practice, supporting high-impact projects at the nexus of environmental protection, social equity, and economic vibrancy. Follow the foundation on Facebook and Twitter, and sign up for regular updates from the foundation. This blog post was originally published on The Conversation.